The Patna Training College has a magnificent double storey building of modern British style spread across 25000 square meteres. 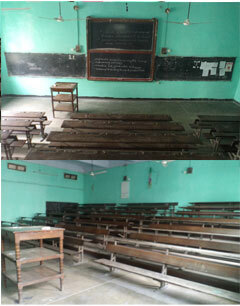 It has a separate campus located at Baripath, Daryapur opposite to the famous Patna Collegiate School. Just opposite to this building is the hostel building. The hostel has 40 single seated rooms and 10 four seated rooms. The Hostel has a capacity to accommodate all the students of the college. The building is equipped with other conveniences required by the students and the staff. The campus also includes residences of the Principal, some teachers and non teaching staff. The college has a multipurpose hall with a sitting capacity of 150. 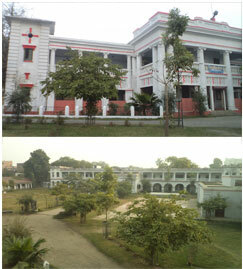 The hall is located in the lush green field in between main building and hostel. It has a unique architectural design for receiving full light in the hall. The middle portion of the hall roof is elevated and fitted with transparent window-pans from all sides. 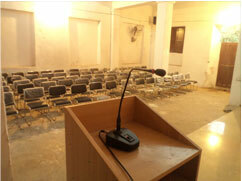 It is equipped with PA system and LCD projector. The College has one of the richest libraries of its kind in the country. It has nearly 1000 volumes of books and subscribes 26 journals in various areas of teacher education and related fields. A substantial number of books and journals are added regularly to the college library. 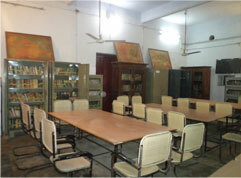 The library room is attached to a reading room with seating capacity of nearly 40 students. The college has a computer lab with ten desktops and a LCD projector. The each computer has been provided with internet facility. The lab is being developed into a resource centre for optimal use of own and outsourced resources. All faculties of the college have been provided with a computer and internet facility at his/her work place. The college has a well equipped integrated laboratory of Physical and Biological sciences. The college also has a well-equipped Maths Lab. There are 15 sets of all required mathematical and geometrical instruments are available in the lab. The college has a well-equipped Psycho Lab. All necessary tests and equipment are available in the lab. As we prepare professionals with pedagogical skills and we are supposed to be the best institution in the field, we have highly interactive teaching-learning process. We discourage one way lecture method of teaching. Our teaching-learning process is based on discussion, brainstorming, projects, seminars etc. The institution provides full autonomy to the learners for constructing knowledge that is well received and acknowledged by the teaching faculty. The institution is full of activities with at least some elements of challenges. We use modern equipments like multimedia projector and LCD monitor for conducting classroom teaching, seminar, discussion, meetings etc. Powered by : Cartel Technologies Pvt. Ltd.